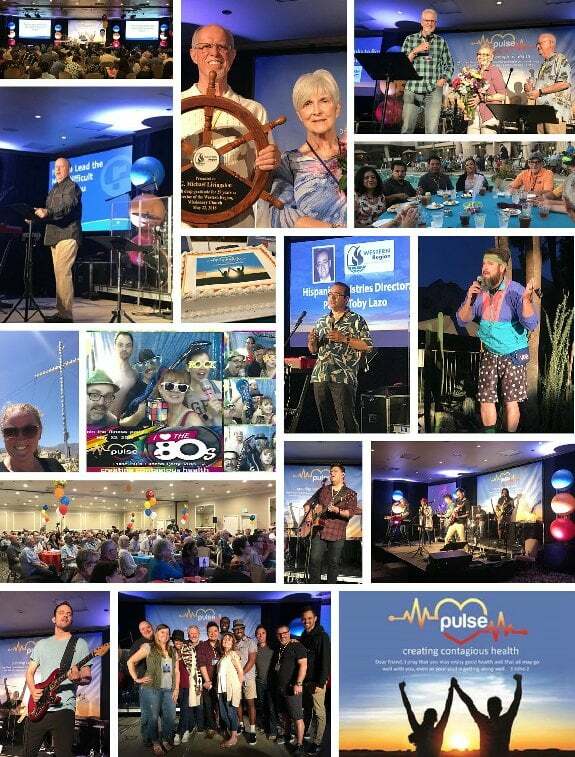 The 99th Annual Missionary Church Western Region Conference was held May 22-24, 2018 at the Indian Wells Resort in the Palm Springs area with our conference theme Pulse…creating contagious health based on 3 John 2. 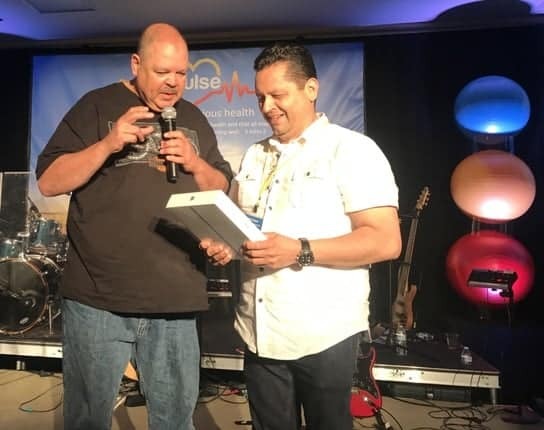 Opening and Introductions…Master of Ceremonies Pastor Chuckk Gerwig welcomed our conference guests for a time of checking our Pulse while creating contageious health! Mike Livingston, Regional Director then opened the conference with prayer. Session 1: HOW TO LEAD THE MOST DIFFICULT PERSON IN YOUR LIFE… 3 John 2. “A leader has a special responsibility to pay attention to what is happening inside himself or herself, lest the act of leadership do more harm or good.” Parker Palmer. We live on two stages…a front stage and a back stage. Your Soul is like the OPERATING SYSTEM for your life. You cannot see it, it runs in the background. However, when it begins to malfunction, everything else starts to break down and shut down. That is why it is imperative to pay attention to our souls. Identify the toxins that are poisoning your soul. You must integrate authentic Spiritual Practices. It is not “Your Career is your life” or “your church is your life”…THE LORD IS YOUR LIFE. Become a student of your soul and that of your team members. Emotional adolescents will always struggle to be great team leaders. Make better Christians, not just better leaders. 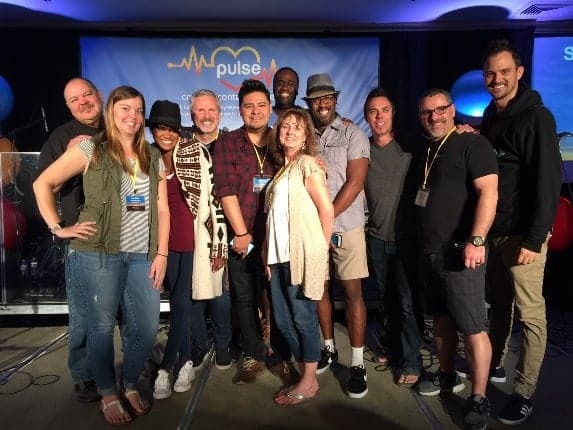 Bring Spiritual formation into the rhythm of your team. The healthiest teams focus on being and becoming as much as doing. Practice relentless clarity and tenacity when it comes to priorities. You can do almost anything you want, but you just cannot do everything you want. Learn the difference between empowering and abdicating. Be more personal, less organizational; more informal, less formal; more coaching, less grading; more dialogue, less Monologue. We live in a universe defined live by Rhythm. You were made to live in rhythm Space and slow are friends to your spiritual health. The Sabbath is one of God’s strategies for helping you live a life of rhythm. Word Sabbath means “to stop” or “to cease”. Sabbath is anchored in God’s design of the universe. Sabbath is anchored in our choseness. You will be healthier (and more fun to be around) when you have a good rhythm of life. For all handouts from our speaker… (Download the PDF HANDOUT) Conference Session Handouts …by Guest Speaker and Founder of Replenish Ministries. AWESOME WORSHIP! 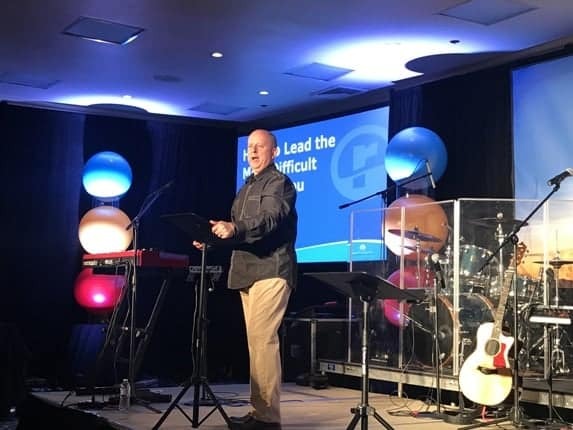 Rounding out the conference presenters were Jim Firth, Senior Pastor at Hope Community Church and 2018 Conference Worship Leader of The Hope Band. We enjoyed another year with our dynamic and professional group of talented musicians from Hope Community Church in Santa Barbara. The Worship Team this year featured: Lead Vocals – Lois Mahalia (who took time off from touring with Joe Walsh to join us), Bass Guitar – William Fiedtkou (Music Director of Hope Community Church and Founder and Music Director of the Santa Barbara Youth Music Academy), Electric Guitar – Gabe Hollis (Hope Community Church Youth Pastor), Percussion – Allan Fiedtkou (Professional musician and private music teacher in Santa Barbara), Guitar, keyboards & Spanish Vocals, Misael Garcia (Assoc. 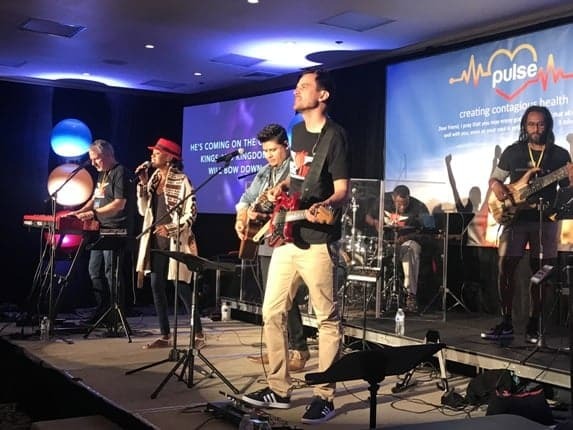 Pastor of Spanish Ministries, Ocean View Church in San Diego) and Keyboard & Vocals – Jim Firth. 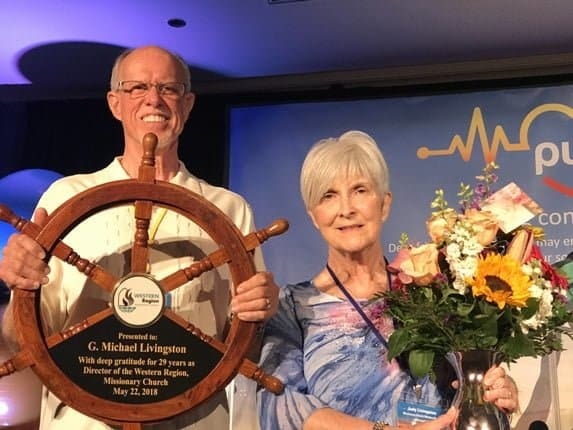 Farewell Celebration for Mike & Judy Livingston and Mary Ellen Dolbier the night ended with a special time of honoring our Regional Director Mike after 29 years and Mary Ellen after 19 years as Office Administrator. ROC Assistant Regional Director Doug Posey made the presentations with flowers, cards, gifts and captains wheel while CFW Ex. Director Kathy Saigeon also shared and congratulated them on a job well done! Many shared their personal thanks and reflections of their service over the years. A great video was shown capturing the moments in pictures of Mike and Judy’s reign. Happy Retirement to Mike, Judy, Mary Ellen! Thank you to our coffee & dessert sponsor: World Partners and Dave Mann Director of Strategic Partnerships, Rick Dugan Director of Int’l Development, and Tami Swymeler Director of Operations for their continued support of our region. World Partners is the International Missions arm of the Missionary Church operating with over 80 professional missionaries world wide. Short term missions are encouraged for churches to participate. Contact Tami at swymelers@frontier.com or visit www.wpartners.org. Generis donated the Kindle Fire PaperWhite giveaway (Congrats to Betty Levy of Living Oaks Church, Newbury Park) along with co-sponsoring the Tuesday Pre-Conference Session: A Legacy Initiative Roundtable with CFW. Generosity Strategist Warren Schuh shared resources and had an informal presentation and discussion about building a legacy. Visit them at www.generis.org. Over the years, I have studied many books that talk about vision, potential and purpose. But very few of the books I read, teach the reasons why many people do not reach their purpose in life. Not long ago, a group of disciples from my church asked me a question about how to achieve God’s purpose in their lives. I must say that many of them were kind of frustrated because they did not know if they were walking toward the goal of reaching God’s purpose. In our discussion, we focused on discovering the different obstacles that prevent us from achieving God’s will. Let me give you four reasons of that will help us reach our purpose in life. As weak as Gideon saw himself, God on the other hand, saw in this man a warrior, someone who could be used to deliver the people of Israel from the Midianites. How do you see yourself? Where there is fear, there is a lack of faith and without faith, it is impossible to please God. Faith overcomes fear, faith focuses on His promises. Sometimes the shortest path is not necessarily the best path. Israel needed to go through a process that they didn’t understand. CFW Breakfast, over 100 participants attended Christian Foundation of the West’s breakfast to hear a welcome from Board Member Chairman, Randall Sanada. President Kathy Saigeon and Sr. Pastor and CFW Board Member, Samuel Gallucci shared a panel to talk about the importance of encouraging Intentional Legacy. Families and individuals know Legacy matters. CFW can help your church encourage investing in Legacy Today for future generations, reinforcing the need to finish well, Hebrews 12:1 …Run with endurance the race that is set before us. CFW can help strengthen your church resources for generations to come! You are encouraged to get to know CFW and learn the ways they can help your church. A panel of Generis Audit participants was moderated by arren Schuh, a Generis Generosity Strategist. Sr. Pastor Ben Meyers and Treasurer/Elder Don Calhoun of Baycities Community Church, Lomita CA along with Exec. 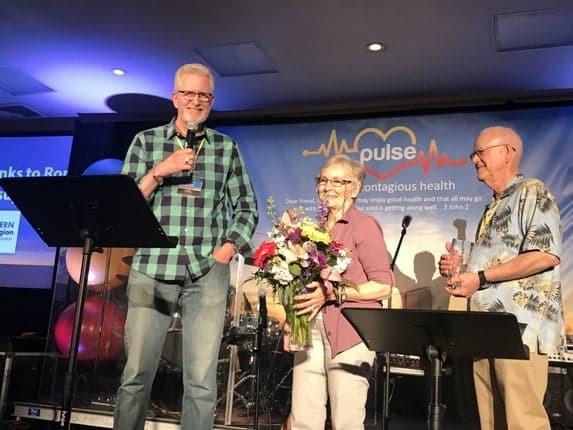 Administrator, Clementine Jasinski of Living Oaks Community Church in Newbury Park CA talked about the success of their Generosity Audits for their churches. They received information and statistics, changed how they communicated, added an 8-week study on the process, and so much more. They encouraged all churches to go through this process especially with the grant that was offered to all Missionary Churches by CFW and Generis. Jill Upson, CFW Dir. of Programs announced a one-day Leadership Development Conference coming September 21, 2018, focusing on donor development and legacy giving including a track specifically for churches. This event will be followed by CFW’s 5th Annual Grant Program. Ministries are encouraged to apply for a grant and all are welcome at the banquet where CFW will award the grants coming in February 2019. Visit www.CFWest.com to register for these programs and events. PULSE Business: Regional Director Mike Livingston led the business session of the conference by calling the conference to order. He then asked for the approval of the following motions. To approve the conference agenda, conference committees and ratify the 97th conference minutes. 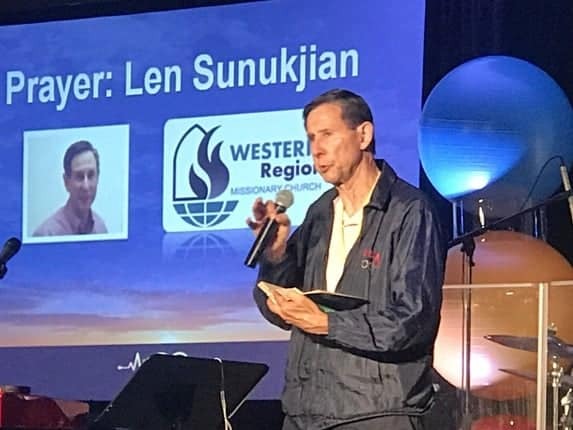 Prayer Warrior, Pastor Len Sunukjian blessed our conference during our general sessions. Many thanks to Len for leading our conference before the Lord even while recovering from illness. Poolside 80’s Fitness Party! Our evening festivities fer sure were the “bomb!” Celebrating everything 80’s with LED glasses, rubiks cubes, big hair and neon! They really threw us for a loop by changing things up at the buffet, by offering the rolls before the potatoes. Entertainment was provided by various MC’s. Chris Schmaltz led our on stage victims with the game, Acting out the 80’s (all stage folks acted out 80’s personalities by singing, dancing, or with words). Our 80’s act was won by the the “one man runaway show title” of Jason McConahy! (Who knew he was so talented!) Emily Gaud led the Freeze Dance game with 80’s tunes and our rad dancers stopping the show. (Even Mary Ellen got to bust a move!) 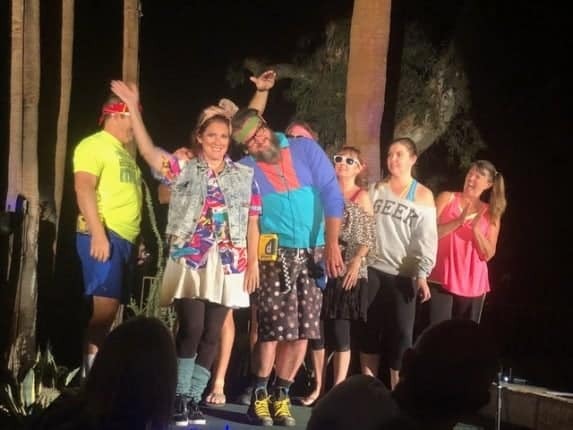 Louis DeLuca led our 80’s Costume Contest and Chris & Marla Schmaltz were “back in time” sporting the 80’s look with madonna and headband outfits winning the Indian Wells Resort luxury suite weekend stay! Clint Garman led the rousing rounds of “pick your brain 80’s trivia.” To our amazement, Cecil Prado must have lived and breathed 80’s since he answered just about every question, winning an Echo Dot from Ratio Christi! Of course our evening included the most awesome props, including a 30 inch cell phone and blow up guitars for our photogenic and totally tubular party goers smiling for our photobooth! 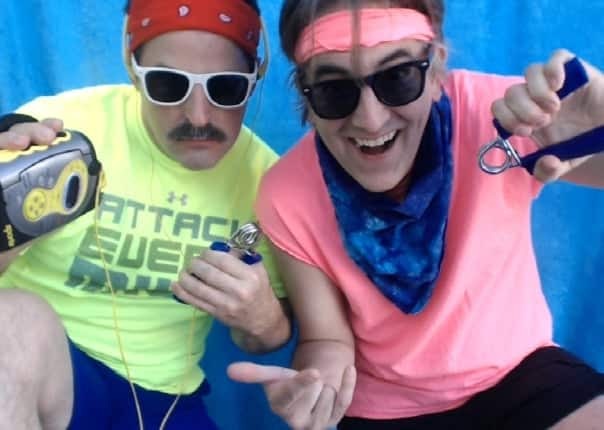 Be sure to see the 80’s Fitness Party Video below! Congratulations to Marla & Chris Schmaltz for winning the best costume contest and awarded a weekend stay in a luxury suite at the Indian Wells Resort Hotel! Also, well done to Cecil Prado for winning the 80’s Trivia and rewarded with an Amazon Echo Dot sponsored by Ratio Christi ministries and Patrick Slaven! 80’s Fitness Party Video…thank you to Gabe Hollis for creating a festive video featuring all of our photogenic photo booth participants! Givaway Winners…Congratulations to Eguene Suh, Granada Hills Community Church – Echo Dot from GTN, Sandra Campos, Aceptado Como Eres (Reseda) – $25 Amazon Gift Card, Ben Meyers, Baycities Lomita – Echo Dot sponsored by Ration Christi, and Rudy Campos of Aceptado Como Eres (Reseda) on winning our super grand prize IPAD! Please visit a new ministry to conference: Ratio Christi, Sponsor of 2 Amazon Echo Dots at www.ratiochristi.org . Ratio Christi (Latin for The Reason of Christ) is a global movement that equips university students and faculty to give historical, philosophical, and scientific reasons for following Christ. Christi is planting student and faculty led apologetics clubs at universities around the world. Join them! Special thanks…We would like to compliment and give recognition for the exceptional talents and many man-hours of our Tech Team: Jim Firth (Tech Team Leader), Jeff Foss (Audio/Visual Direction), Steve Broggie (Audio Tech), Gabe Hollis (Videographer & Stage Setup), Pete Hollis (Equipment Transportation) and Ellie Milne (Tech Support). We wish Jeff Foss and his family the very best as they move to Nashville after working with us the last 10 years of conference! Riches blessings to the entire team from Shelly who will miss you all immensely! Special Note from Shelly Yee to all conference guests! It has been my absolute pleasure to share with you conference over the past 17 years. It was my prayer that all of you felt encouraged, renewed and loved as you serve your ministries. I will miss each and every one of you and I’m so sorry I didn’t get to say a personal goodbye at conference, as I didn’t know it would be my last. May God bless you, your families and ministries from your biggest admirer! Kudos to the entire SPT/Regional Conference Team who are already planning next year’s conference, May 21-23, 2019…Be sure to join us for our 100th Anniversary Celebration!